The warning tapes and danger signs are a quick an effective way to limit entry to hazardous or restricted areas. They can reduce the risks of injury to employees when a potentially hazardous situation is present in an area that could affect employees' safety and health. Custom text imprint service is provided. The Caution Signs that warn of a hazard or hazardous situations where care should be taken. 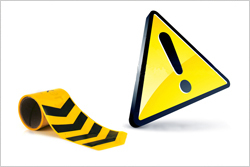 The Caution Tapes are designed for road traffic signs, safety warning and other warning applications.